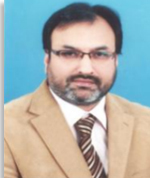 Dr. Shahid Munir did his BSc Chemical Engineering and MSc Chemical Engineering from the Institute of Chemical Engineering & Technology, University of the Punjab, Lahore. He won gold medal by securing first position in MSc Chemical Engineering. He did MBA marketing with distinction from Punjab University. He has 10 years of Industrial experience on his credit. On the basis of his outstanding academic and professional record, he was selected as Assistant Professor in 2003 at the Institute of Chemical Engineering and Technology, University of the Punjab. During his teaching career, he has been involved in delivering lectures to BSc Chemical Engineering and MS TQM students. He has also supervised thesis of BSc Chemical Engineering and MS TQM students. He obtained outstanding performance award from Punjab University in 2005. He did his PhD from University of Leeds, UK. He participated in many International/national conferences/ and workshops. His area of research is Biomass-Coal co-combustion and his research work has been published in International and national journals of high impact factor.